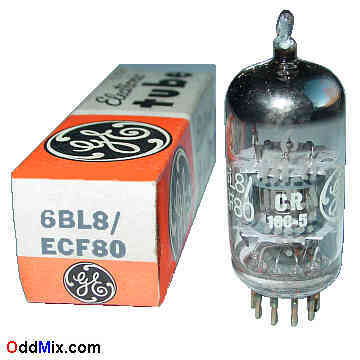 This is an original GE 6BL8/ECF80 Medium-Mu Triode, Sharp-Cutoff Pentode electronic tube. This Frame Grid tube is useable in VHF television and FM receivers. A Medium-Mu triode is useful for many other special purpose circuits like oscillators, RF amplifiers, replacement part, circuit research and experimentation or for replacement, antique radio, instrument, TV television restoration projects, experimentation, circuit research or to set up a private vacuum tube museum. It is NOS tube - New Old Stock, unused, boxed, excellent condition.